This 5 inch gold ceramic tumbling cherub candle holder will hold a standard taper candle. 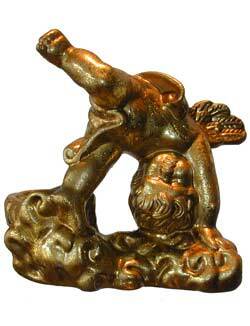 The cherub is tumbling to his left with his head down and his right leg is in the air. Both arms and the left leg are down to support the cart wheel tumble. The candle holder is behind his left foot. The candle holder is about 5 inches tall, 5 inches long and 3 inches deep. The wings are about 1.5 inches long on the gold cherub.